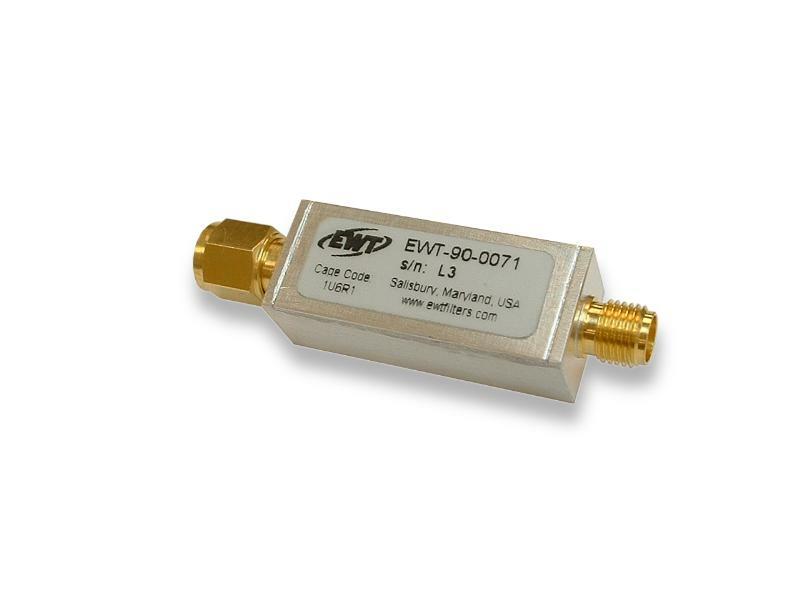 Insertion Loss Equalizer model EWT-90-0071 has 5dB negative insertion loss slope over the passband of 1110 – 1450 MHz. The insertion loss is approximately .5dB at 1450 MHz with 5dB relative loss at 1110 MHz and 3.4dB mid-band loss. The insertion loss slope is 1.3dB +/- .75dB per 100 MHz. The return loss over the passband is 15dB minimum. The overall size is 1.25” x .50” x .40” with SMA Male input and SMA Female output connectors. Contact Us Today or call us at 410.749.3800 to see how Eastern Wireless TeleComm, Inc. (EWT Filters) can help your meet your customized filter needs. Navigate Forward and Backward by Clicking the Buttons Below.